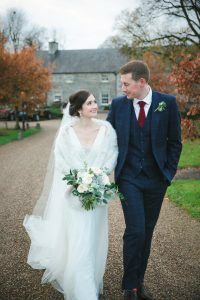 If you’ve always dreamed of a cosy celebration with rich reds, hot chocolate and golden leaves then an Autumn wedding might be perfect for you! 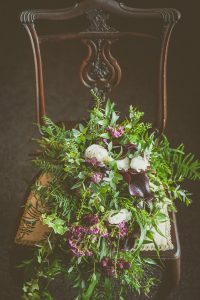 And with such a naturally beautiful colour scheme an Autumn wedding at Clonabreany has so many possibilities! 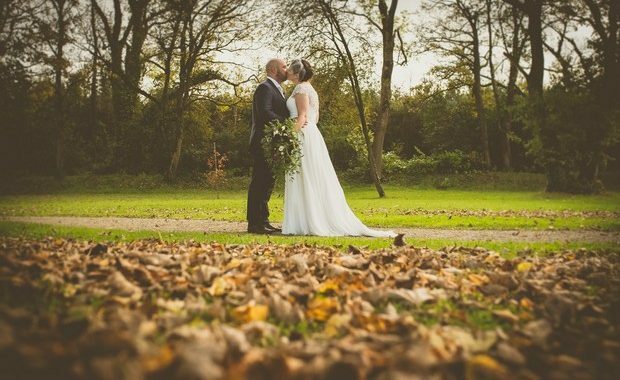 Autumn is a beautiful time of year to get married! 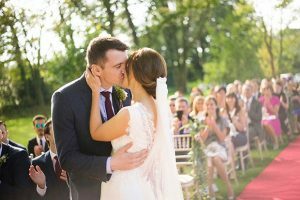 The temperature is usually perfect for weddings, your guests won’t melt in a summer heatwave, but they won’t be too cold either and we start to see the beautiful autumnal colour palettes! 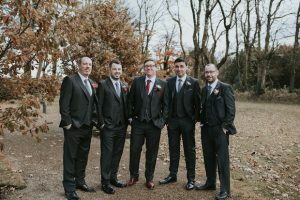 We just love seeing rich burgundy bridesmaid dresses, rugged navy suits for the groomsmen and lots of tiny antique gold details! 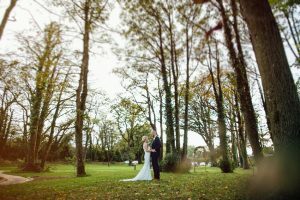 Some of the most stunning warm, natural backdrops are made in Autumn. 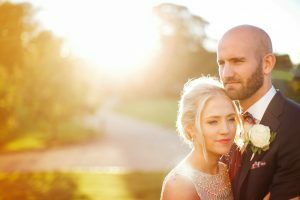 Burnt orange leaves covering the grounds and the golden light that Autumn brings provide a stunning backdrop of gold, amber and red for that perfect Autumnal wedding theme. Take a look at our Autumn gallery to get a feel for what the grounds look like during the Autumn months. 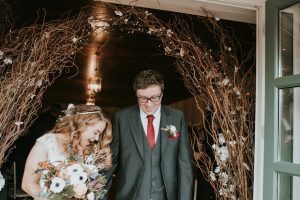 We love when couples play with the Autumn colour palettes and seeing how they bring them into the overall theme of their wedding! 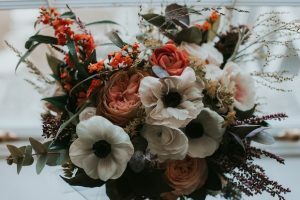 Whether you are planning on some gorgeous floral displays, or whether you are going to be incorporating some Autumnal tones throughout your decor, Autumn offers up some of the most beautiful rich earthy colours! Autumn really does provide the most beautiful light for photos! 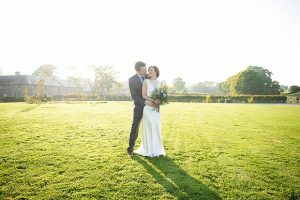 We love how the golden light bounces off the beautiful natural backdrop to give the perfect Autumnal setting! As for the sunsets, well they’re just magical! In fact, we think Autumn sunsets might just be our favourite! 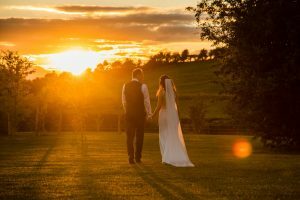 Make sure you step outside just before sunset to get the perfect picture! We couldn’t forget to mention one of the biggest events in Autumn is of course Halloween! Whether you want to go all out with a fire pit and a Halloween theme or whether you want to add a few pumpkins into the decor, we love something that’s a little bit different. 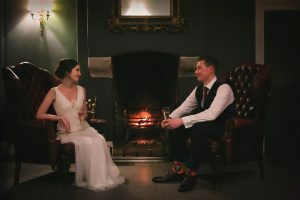 What a great Halloween themed wedding Pamela and Stephen had! 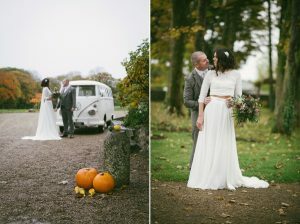 Pumpkins, an amazing Doughnut wedding cake, and Pamela’s dress! 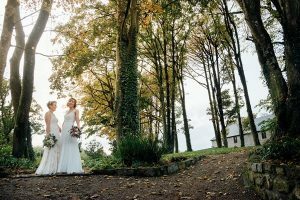 So if you’re dreaming of rich reds, fallen leaves, hot chocolates and golden make up trends, then an Autumn Wedding at Clonabreany is perfect for you! Posted in Autumn Weddings, Weddings at Clonabreany and tagged autumnweddings, clonabreanyweddings, Weddings.